Indian Vegetarian Recipes: Ahloo Paratha is an Indian recipe that’s stuffed with spiced potatoes. 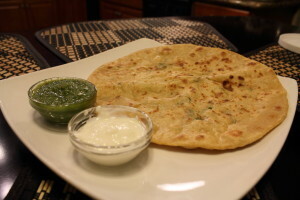 Ahloo Paratha, which translates to potato bread is one the many classic Indian vegetarian recipes. This is an extremely popular dish that’s best served fresh off the stove. This bread can be eaten with a variety of condiments like yogurt or green chutney. Microwave them for about 20-25 minutes depending on the size of your potato and strength of your microwave. The potatoes are cooked when they are extremely soft and easy to peel. While the potatoes are cooking in the microwave, prepare the dough by adding 5 cups of flour to a large bowl. Add 3 cups of water to the flour. Knead the dough. Add more water as needed (sprinkle on slowly) by the dough to get the proper texture. Knead the dough again as needed. Add ¼ teaspoon of salt to the dough. Mix. Once the potatoes are done, peel and mash the potatoes. Put the mashed potatoes in a large bowl. Chop up the following: cilantro, green onions, green chillies and ginger. Add to the potatoes. Add ½ teaspoon of salt to the potatoes. Add the following as well: black pepper, cumin seeds, crushed red chilli peppers, and squeezed lemon juice. Pick up enough dough to make a ball that fits in your palm. Flatten the ball and add a handful of potatoes to the dough. Wrap the dough around the potatoes to make a dough ball in which the potatoes are in the center. Roll the potato filled dough into a circular shape. Meanwhile, heat the pan. Once the pan is hot, add your bread to the pan. Once one side of the bread is light golden brown, flip it over again. Then, add 1 tablespoon of corn oil all around the edges of the bread. Once the other side is also light golden brown, then flip it over again. Add ½ tablespoon of oil all over the bread itself especially where it’s dry. There should be no dry flaky spots on the bread. Cook both sides until you have a medium golden brown bread. Repeat steps 9-16 to make as many as you’d like or until ingredients are finished. Serve with condiments like yogurt or chutney. Enjoy!